Jeff lives in Colorado where he manages a cattle ranch. His passion for working livestock horseback has afforded him to cowboy throughout the U.S. and abroad over the years. Having studied and worked with many breeds of horses in various disciplines, his journey led him to an intense appreciation of California's vaquero style horsemanship. 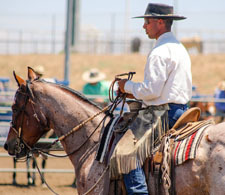 Rooted in classical Spanish horsemanship, coupled with the requirements for working wild cattle in rough terrain, Jeff sees this style as a near perfect combination of artistry and functionality, and the gear and techniques of early Californios can still be very relevant in today's equine and ranching worlds. Although Jeff has spent much of his life starting colts and rehabbing "troubled" horses preparing them for cattle work, arena competition or recreational use, he now ardently adheres to the "Jaquima a Freno" process - hackamore, two-rein, spade bit - and openly shares how this traditional approach has so positively affected his life...and his horses. We're honored to have Jeff travel from Colorado to share his committment to the importance of continuing California's vaquero traditions and what it means to him. You will not want to miss any of Jeff Derby's 2018's presentations. He will be horseback Saturday & Sunday.